Paul-Emile Colin, born in Lunéville, went to Paris to study medicine, but there he met the painter Filiger who interested him in the works of the mystical symbolist painters, and in 1890 introduced him to Gauguin in Pouldu. At first Colin began to draw and paint while still pursuing his medical studies, but in 1899 he decided to abandon his career in medicine and dedicated himself entirely to painting, engraving and illustration. He quickly became a master of wood engraving and eventually served as the Vice-President of the Société de la Gravure sur bois originale. 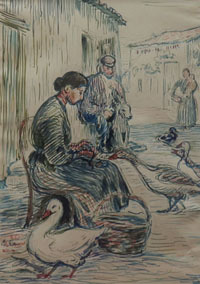 In 1902 Gustave Geffroy organized an exhibition of Colin’s work which had great success. Colin illustrated works by Emile Zola, Anatole France, Maurice Barrés and other important French authors, as well as a French translation of New Selected Tales of Rudyard Kipling. His wood engravings are represented in the Library or Art and Archeology and in the regional museum of Lunéville. He was a member of the Société Nationale des Beaux-Arts and exhibited frequently at the Salon d’Automne in Paris. Gérald Schurr and Pierre Cabanne Dictionnaire des Petits Maîtres de la peinture, 1820-1920, Les Éditions de l’Amateur, Paris, 1996.